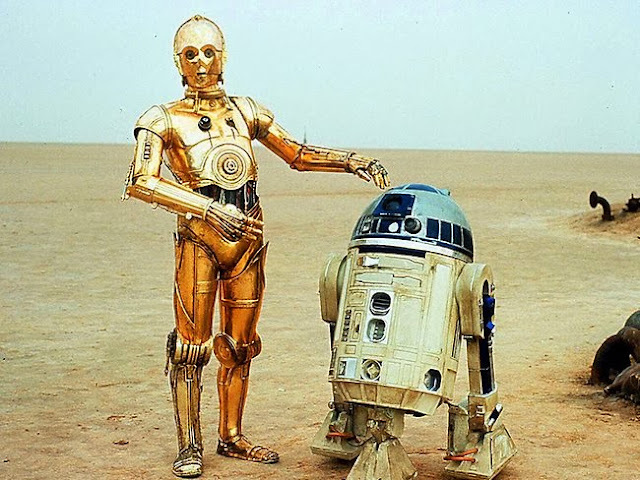 The droids everyone are looking for are the odd couple of the Star Wars franchise. One's a cheeky astromech, the other a golden protocol droid whose a stickler for the rules. R2D2 and C3PO have been there from day one since they were given some secret plans by Princess Leia with a mission to get them to Obi Wan Kenobi - in fact they were around when Anakin Skywalker was an idealistic cherub who was into pod racing. This is to say these androids have had many adventures and given viewers many laughs! Here's some cool facts and trivia about them, the actors that fit into the tin suits and how they came to be the most heroic robots in the galaxy. Anthony Daniels, who voiced C3P0 and climbed into the tin suit, is the only actor to appear in all 7 Star Wars films - you have to count The Clone Wars animated film of course! Kenny Baker did not actually film anything for Revenge of the Sith, his parts were a mix of CGI and footage recycled from Attack of the Clones. C3PO's most famous quote is perhaps "I suggest a new strategy, Artoo: let the Wookie win." which pretty much speaks for itself!. As a side note, that game between Chewbacca and R2D2 was never finished. When Finn bumps the table in The Force Awakens, it's the same game of Dejarik from A New Hope! A lot of people miss it, thinking the C3PO is totally golden but his right knee down is silver. In The Force Awakens, he had a red arm for most of the film. R2 stands at 96cm tall. R2D2 was infamously given the ability to fly in the prequel films which bugged many fans (despite the fun he had on screen). This was rather roughly explained in other fiction that after the Clone Wars the company responsible for the development of his boosters went out of business. When his rocket boosters were damaged they were unable to be repaired. R2D2 and C3PO were snuck into a scene in Indiana Jones and Raiders of the Lost Ark as well as JJ Abrams' two Star Trek films. The characters were so popular they had their own animated television series for a short time and once appeared in episodes of The Muppets and Sesame Street where R2 oddly appeared to fall in love with a fire hydrant! R2D2 served several masters - starting with Padme, Anakin, Bail Organa, Leia Organa, Luke Skywalker and for a time, Jabba the Hutt... 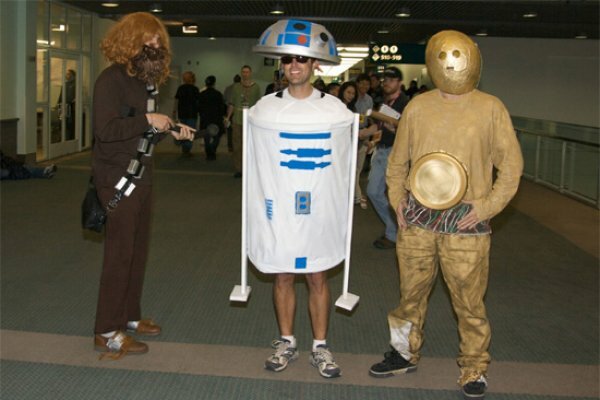 In the expanded universe R2 accompanies the decendants of Skywalker on many adventures. When Obi-Wan finds General Grievous on the planet Utapau, his first words are, "Hello, there." This is exactly what said when he first met R2-D2. Did you think this was a good list? Here's 101 facts about Star Wars!